Joy Creek Photo Archive (c) all rights reserved Sea-greeen might best describe the color of the tiny succulent lozenge-like leaves of this ground covering sedum. The flowering stems can rise up to two inches. They bear clusters of 12-13 tiny cupped flowers that are pink on the outside and white in the interior. 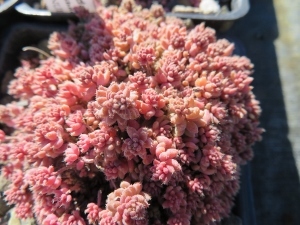 One wonderful application for Sedum dasyphyllum 'Lloyd Proeger' is to use it as a single specimen in a shade container. If you do not let the container dry out, it will look attractive twelve months a year.